HARTFORD (March 31, 2011) – Popular Connecticut heavyweight Tony “TNT” Grano will be in a crossroads fight April 9 when he headlines “The Willie Pep Boxing Classic,” presented by Hard Hittin’ Promotions (“HHP”), at the Connecticut Convention Center in Hartford. Grano (17-2-1, 13 KOs), fighting out of nearby Hebron, faces veteran “Diamond” Dominque Alexander in the 8-round main event. Grano, the WBF All-Americas heavyweight champion and 2005 U.S. Nationals winner, is coming off his second career loss, the first by stoppage, last June to Nicolai Firtha in June. Grano hopes to get back where he was in 2009, when he knocked out previously unbeaten Travis Kauffman (18-0) on ShoBox. “I feel real good and have been training hard,” Grano reported. “I’ve been getting good work in the gym, hitting the roads running, and I’ve been working with good sparring partners. I feel sharp and I’m excited about getting back into the ring. I felt that I got a bad shake in my last fight where there was an early stoppage. I was in great condition, physically, but not mentally. I wasn’t focused and didn’t have a good game plan, Not being focused killed me. Alexander has fought WBO heavyweight champion Shannon Briggs and current WBO cruiserweight titlist Krzysztof Wlodarczyk, in addition to world heavyweight title challengers Kali Meehan and Fres Oquendo, and Odlanier Solis. 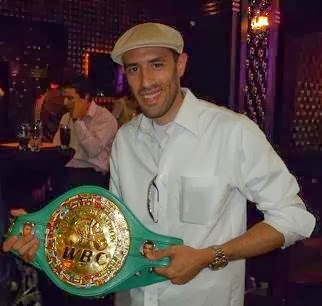 “I know Alexander is experienced with over 30 fights against guys like Briggs and Solis. I do know that every time he’s stepped up he’s been stopped. I don’t take anybody lightly but, personally, I don’t think he can last more than four rounds with me. Not the way I feel right now. I’m very confident and in great shape. This is a good guy for me to get back in the ring with. The undercard showcases some of the best young fighters in New England, including Meriden (CT) by way of Mexico bantamweight Danny Aquino (5-1, 1 KO) vs. James Owens (4-2, 2 KOs), Puerto Rican junior welterweight prospect – training in New Haven – Javier “El Chino” Flores (5-0, 4 KOs) vs. game Norwalk (CT) veteran Shakha Moore (10-15-3, 2 KOs), and promising New Haven featherweight and former amateur standout, Luis Rosa (5-0, 2 KOs) vs. Tommy Attencio (4-6, 2 KOs), all in 6-round bouts. Undefeated East Hartford Joseph “Chip” Perez (5-0, 2 KOs) faces Charles Vanderveer (1-1, 1 KO) in a 4-rounder. Also scheduled to fight on the undercard are a pair of Middletown (CT) favorites, light heavyweight Doug Cartelli (1-0) and pro-debuting junior middleweight Willie Picard. They’ll be facing the Williams brothers, respectively, Jaquan (pro debut) and Charles (0-1), from North Carolina. All fights and fighters are subject to change. Tickets are priced at $100.00 (ringside), $80.00 (preferred seating), $60.00 (reserved) and $40.00 (general admission) and are available to purchase by calling 860.402.4838 or The Lions Den at 860.613.2394. Willie Pep: Born Gugloermo Papaleo in 1922 in Middletown, CT. He was a 2-time world champion who retired in 1966 after a 26 year professional career with an amazing 229-11-1 (65 KOs) record. In 1990, Pep was inducted into the International Boxing Hall of Fame in Canastota, New York. He died November 23, 2006 at the age of 84.